In conjunction with designers, builders and artists Robert specializes in photographing and reproducing images on canvas, watercolor paper, traditional photographic surfaces and other substrates. Ultrachrome prints are made on Premium Luster or glossy surface paper, using a state-of-the-art Epson 9800 printer. These prints are made with high resolution, wide color gamut pigment inks which are rated to last 100 years or more. Print sizes 16×20 and above include optional 8×10 test prints at $3.50 per print. Every effort is made to match or improve upon the color intensity and brilliance of the original slide, negative, or flat art piece. Larger sizes are available on a per quote basis. These reproductions are individual collaborations between the artist and the printer. There are three paper surfaces to choose from: watercolor paper, radiant white 225gm; smooth fine art, 225gm or 425gm; and textured fine art, 225 or 425 gm. * These quantities are priced on a per-quote basis. Proofing service is also available at $55.00, which includes a minimum of 2–4 proofs. 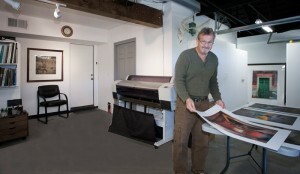 Proofs are recommended for larger print sizes to fine-tune the color and tonal values of the reproduction. Larger sizes are available on a per quote basis.